Why do we cook the way we do? Are you the innovative type, used to expressing your creativity instead of just following recipes? Do you want to learn to be a better cook or curious about the science behind what happens to food as it cooks? 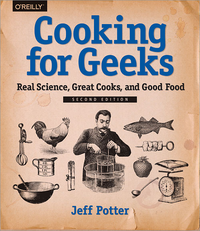 More than just a cookbook, Cooking for Geeks applies your curiosity to discovery, inspiration, and invention in the kitchen. Why do we bake some things at 350°F/175°C and others at 375°F/190°C? Why is medium-rare steak so popular? And just how quickly does a pizza cook if we overclock an oven to 1,000 F/540 C? 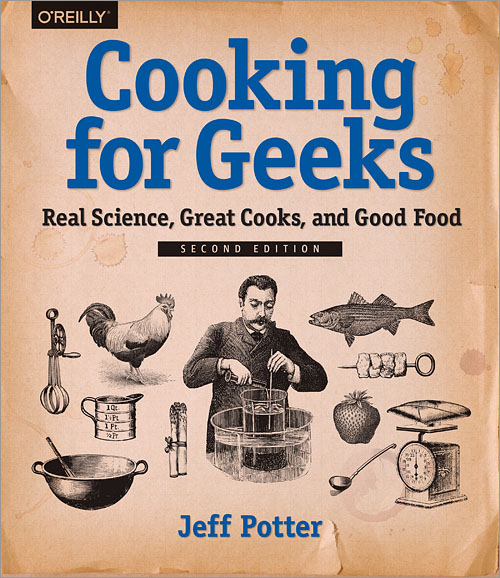 Author and cooking geek Jeff Potter provides the answers to these questions and more, and offers his unique take on recipes -- from the sweet (a patent-violating chocolate chip cookie) to the savory (slow-cooked brisket). This book is an excellent and intriguing resource for anyone who enjoys cooking or wants to experiment in the kitchen.